As a person who is generally quite careful with getting ripped off, I loathe the time when my car needs a service. Who would you trust with your car service when you don't know much more about your car than where the ignition is? 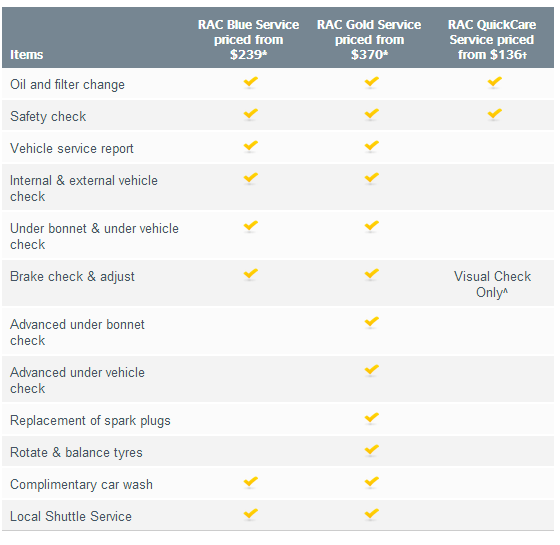 When we bought our car, we got RAC to do a full inspection on the car. I think that is how they got my details and in six months time, they sent me a letter offering a Blue Service for $99. I largely ignored this letter until later when I finally got around to checking up online how much a RAC Blue Service normally is and what it entails, I was surprised to learn that it normally costs $239! I decided to give the RAC a go and booked the car in for a service, as well as a complimentary shuttle to get me to work and back later to collect the car. The service went smoothly and I did not get a call in the afternoon suggesting that they make $3000 worth or repairs or anything. The car was washed (only on weekday services) and no hidden costs were leveled at me. I think $99 is probably as cheap as they get. Do you know of any other car service offers going around that you'd recommend to others? Leave a comment.